The Confession of Sultana Daku is Sujit Saraf’s second novel, after the much acclaimed and beautifully written The Peacock Throne. In the book, Saraf turns back the clock and weaves an interesting story based around popular folklore. Set in the early 20th century, the book follows the interesting journey of Sultana, a bhantu who grew up to become a dreaded dacoit and defied the British on many occasions. The story begins when Sultana is waiting in cell for a British officer, Lt. Col. Samuel Pearce. Under the influence of charas a day before he is to be executed, he wants to lay bare the story of his life to the British officer so that it can be read later by Sultana’s son. Sultana misses his son dearly and hopes for a better life for him. 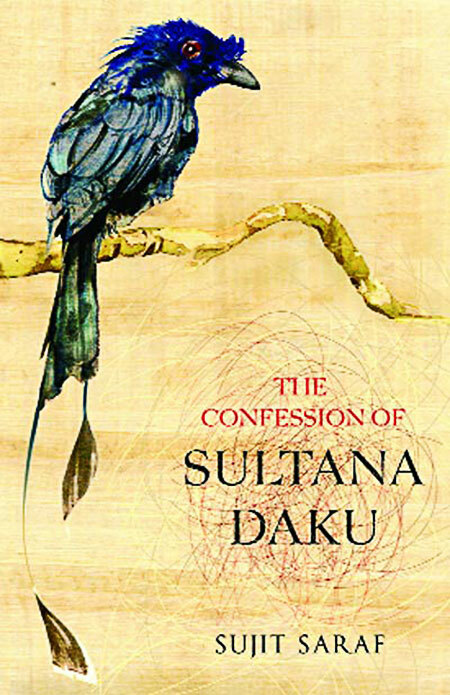 The Confession of Sultana Daku book cover. Through the night, Sultana gets nostalgic about his past while talking about his grandfather, a man who could open any lock and burgle any house under different disguises. He narrates how he learns the trade from his grandfather, their life in the camp, where the bhantu community, seen by the British as thieving, low class criminals, were confined and the Muktifauj taught from the ‘Shepherd’s’ book. The story builds up with his friends, Bhurey, Gajendar, and others he makes at the camp, and their discontentment with their confined surroundings. They escape after Bhurey kills Adjunct Anand—this is where the pace accelerates. The rest of the story is about how Sultana builds a band of men and loots baniyas and other communities in surrounding villages while taking shelter in nearby forests. The police is often hot on their trail, but thanks to a mix of ingenuity and good luck, Sultana and his boys manage to get away. At one point, even Jim Corbett (Carpet Sahib) joins the police in hunting Sultana down. There are many funny instances in the narration by Sultana. It is clear that in some cases, possibly due to the influence of charas, he contradicts himself and, in some situations, grossly exaggerates, mostly about the many feats that he has accomplished with his gang. He also comes across as truly believing that he did the right thing and paints himself as a victim of prejudice. Many of the instances where he remembers his grandfather’s words of advice (often funny one-liners on the traits of a community) are hilarious, as are the comparisons to King George V (George Puncham), the looting at Rai Bahadur, Tirith Singh’s daughter’s wedding, and the cat-and-mouse game with the baniya Dayanand. Finally, what brings him down is a combination of his own insecurities and excesses, along with betrayal by a nautch girl, Phulkanwar, who he is in love with, and another trusted companion. While he waits for his end, the legend becomes human and hopes for a miracle, fearing what is to become of him. You do begin to like Sultana for all his failings and feel sorry for him in the end. This is a spellbinding tale, and Saraf has done a fantastic job of setting the scene and tone of the novel with his taut narrative and vivid descriptions of the landscape where the story is set (parts of Uttar Pradesh/Uttarakhand). Brimming with intensely believable and remarkably portrayed characters, and a rich social detail, this is one of the most intuitive and dazzling works of fiction by an Indian writer in the recent past. Ahmed Faiyaz, a writer, book-lover, strategist, and budding filmmaker, is the co-founder of Grey Oak Publishers and the bestselling author of 'Another Chance' and 'Love, Life & All That Jazz...'. He has also co-edited the bestselling anthology, 'Down the Road' and has contributed stories to the popular 'Urban Shots' collection. By Bhanuj Kappal · Vivek Rajagopalan’s music manages to sound both global and indigenous at the same time. By Anantika Mehra · The book explores chauvinism, patriarchy, and the male psyche in an interesting and honest manner.